﻿Disney Junior’s popular show, Doc McStuffins, is inspiring many of our future doctors and medical professionals. The show is positive and uplifting, and encourages children to care for others. Now your aspiring lifesavers can continue their adventures in practice with the Take Care of Me Lambie toy. 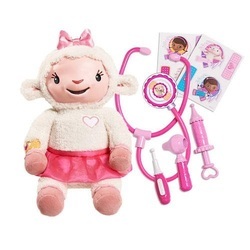 ​Your child, armed with stethoscope, thermometer, otoscope, and sticker bandages, will now transform into Doc McStuffins and can diagnose and care for the interactive Lambie toy. With more than fifty interactive gameplay through words, songs, lights, and movements, and three different triggers for responses, the toy will provide your child with hours of fun. There’s also the signature “go stuffed” action when playtime ends. Dottie 'Doc' McStuffins, a six year old girl, 'fixes' toys, with a little help from her stuffed animal friends, Stuffy, Hallie, Lambie and Chilly. Now your child can take care of Lambie, just like Doc! Lambie sings and says phrases, such as "I don't feel well Doc". Use Lambie's tools to make her feel better and watch as she responds to the medical tools. Check in her ears with the otoscope. When you find out what is wrong with Lambie give her a cuddle or use the syringe to make her feel better. If your little ones love the Doc McStuffins show, then this is the perfect gift. It gives them an opportunity to reenact their favorite moments from the show and extend their imagination and storytelling prowess by creating new scenarios for Lambie and the Doc. Children will enjoy using the medical tools to diagnose Lambie’s illness. She even tells them what’s wrong with her! After some gentle care from the Doc, she’ll lie down and take a nap. And when she’s feeling better, she will giggle and sing when her tummy is pressed. The “I feel better” song is a particular favourite! Positive values such as kindness and compassion are encouraged through play. It’s also great for two or more children to play together since this toy fosters social interaction. Children can relive their favourite moments from the show. Lambie even uses the beloved “Go stuffed!” phrase when playtime is over and the Doc has healed all the toys. The show acts as a starter to get imagination flowing and the toy then allows kids to turn the positive messages into creative play. Some reviewers felt that the fabric appeared flimsy and worried that it might not withstand too much rough and tumble during play. So, just remind your little doctor that he or she needs to treat Lambie gently. Otherwise, Lambie might end up more ill.
​Is the Take Care of Me Lambie Worth Buying? ​For fans of Disney Junior’s Doc McStuffins series, this toy is a great way to extend and develop the show’s positive messages. Learning to nurture and care for someone, even if it’s only a lovable soft toy, is a wonderful way to develop socially. We need people who show kindness and compassion and the Doc McStuffins Take Care of Me Lambie toy helps to teach these virtues from a young age. It’s also super adorable and great to cuddle and sing along with!